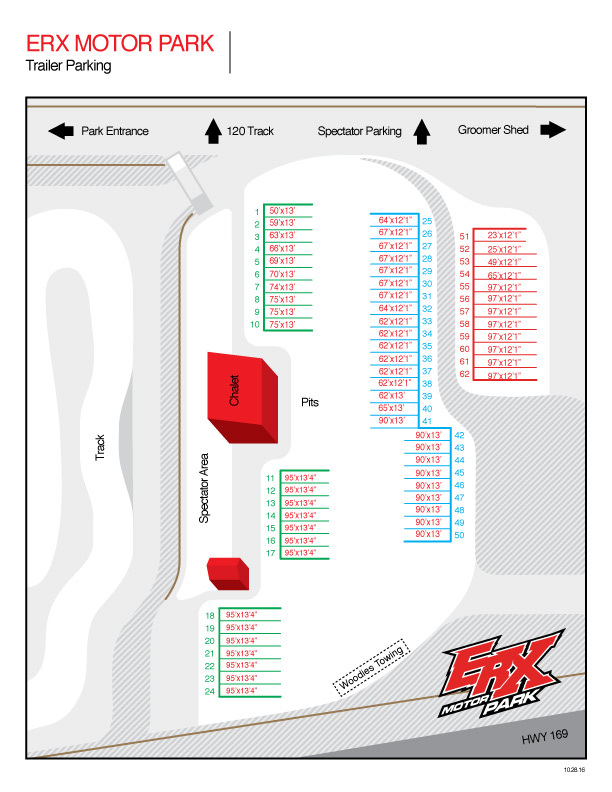 Grassroots Snocross Parking for the 2018-2019 Season. SEASONAL TRAILER STORAGE: $500, plus tax. ($534.75 after tax) –this is in addition to reserved parking fee. Please email hgoodin@sportechinc.com to purchase seasonal parking.  EACH PARKING SPOT IS ALLOWED ONE VEHICLE AND ONE TRAILER. ALL OTHER VEHILCES AND TRAILERS WILL NEED TO PARK IN SPECTATOR OR TRAILER PARKING LOTS, REGARDLESS OF IF THERE IS ADDITIONAL ROOM IN THEIR PARKING SPACE.  OCCUPANT AGREES TO STAY WITHIN THE CONFINES OF THEIR PARKING SPOT TO KEEP ALL NECESSARY FIRE LANES OPEN AND ASSURE THERE IS NO BLOCKING OF OTHERS PARKING SPOTS.  UNLESS ADDITIONAL TRAILER STORAGE FEE HAS BEEN PAID, OCCUPANT AGREES TO REMOVE THEIR TRAILERS FROM ERX PROPERTY AFTER EACH RACE.  ERX SHALL NOT BE LIABLE FOR ANY SICKNESS, DISEASE, THEFT, DEATH, INJURY OR OTHER DAMAGE TO OCCUPANT, OCCUPANT’S FAMILY, OCCUPANT’S GUESTS OR OCCUPANT’S PROPERTY. OCCUPANT AGREES THAT ALL RISKS RELATING TO STAYING AT THE SITE ARE TO BE BORNE BY OCCUPANT. © 2019 ShowClix on behalf of ERX Motor Park. All sales are final. Tickets are non-refundable.